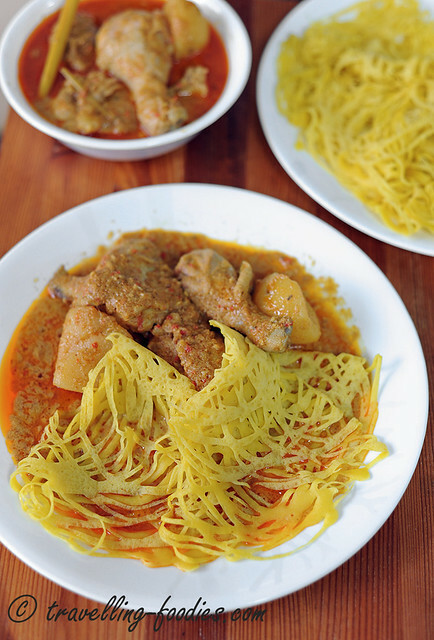 For a good roti jala, the “holey” effect should be very prominent. The batter should be narrow and stringy looking and this boils down to several things. Firstly, the consistency of the batter is important. In the days where there weren’t weighing scales, much of the prep work done by the bibiks and makciks were all through “eye-balling” or what is known as “agakration“. It is not difficult to know if the batter has reached the right consistency. One merely has to lift up the whisk or fork which is used to stir the batter and observe the “flow”. The batter should run off the whisk in a single continuous stream without any truncation in a rather swift manner. If the batter dribbles and drips or becomes too gooey and viscous to flow with great ease, it means that it is either too thin or too thick. So it helps to have an extra bit of flour or coconut milk to thicken or thin the consistency as required. Secondly, failure to maintain an appropriate cooking temperature is another possible cause for the batter to spread too much. If the temperature is too low, the poured in batter may not cook fast enough, thus allowing the batter to spread considerably. If the temperature is too high, the bottom side may brown too much before the top layer dries up completely. 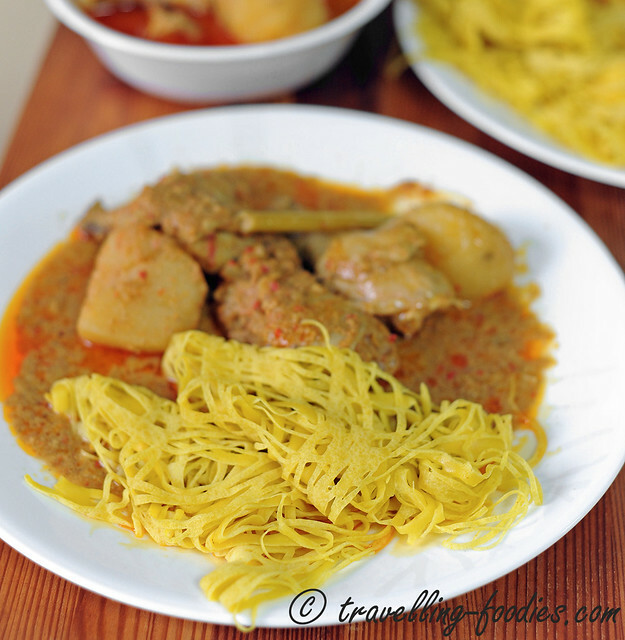 The third factor which determines how the Roti Jala would end up looking is the mould used. 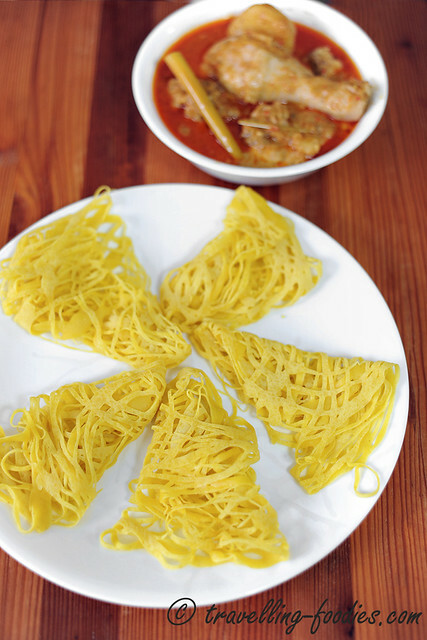 Traditionally Roti Jala were made with just a cone-like funnel out of banana leaves secured with thin and flexible sticks. 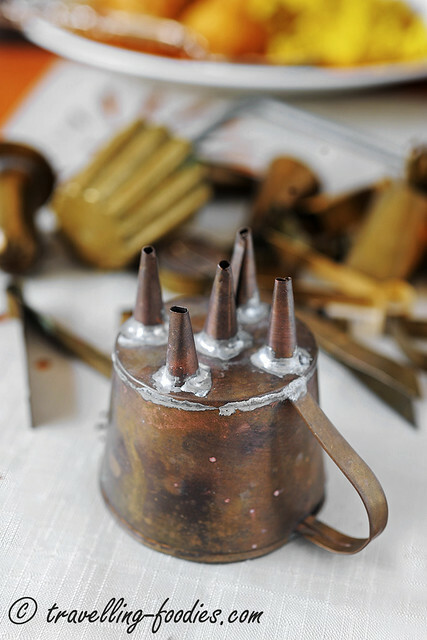 Then came the ones made from copper which looked like a cup with small funnels soldered to the base. Copper was phased out and in came those made of plastic which looked just like their metallic antecedents. Some folks which are more innovative started using plastic squeeze bottles for mayonnaise, or even recycling mineral water bottles with holes pierced out from the caps. The last method works remarkably well and it is practically fuss-free as the disposable bottles save the hassle of washing! Whichever the vessel one uses to introduce the batter into the pan, a little practice is all that is required to get lovely stringy swirls that results in crepes or pancakes which look really like fish nets! Place all the ingredients except flour and oil into a large bowl and mix well to homogenise. Sift flour directly into the wet ingredients mixture over several additions, mixing thoroughly in between successive additions. Test the consistency of the batter by lifting the whisk or fork used for stirring the mixture. The batter should have a slightly thickened consistency thus allowing it to flow continuously back into the bowl in a single unbroken stream. Adjust the batter consistency with either more flour or coconut milk, adding only one tbsp in between each check accompanied by very thorough mixing to ensure good corporation of the ingredients. Strain the batter into another bowl to remove any flour lumps or unbeaten egg white. Using a non-stick flat saucepan, lightly grease with oil and wipe off excess with kitchen towel. Swirl the batter into the pan by making circular loops starting from the perimeter of the pan towards the centre. When the roti jala dries up considerably and separates from the panm dislodge with a spatular and fold into halves and then quarters. Repeat the process until all the batter is used up, greasing the pan once every 2-3 crepes. 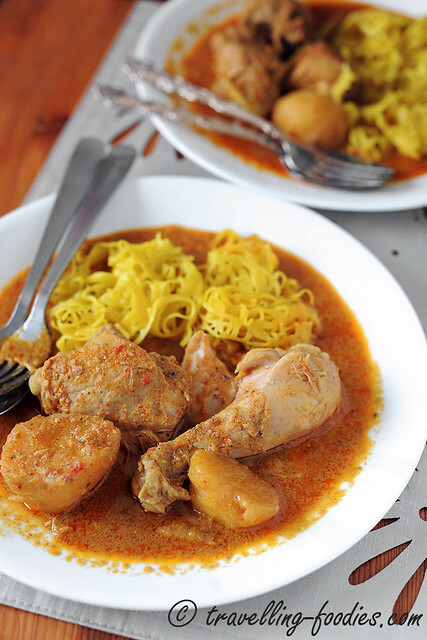 Serve warm with Kari Ayam, Gulai Ayam or even your favorite rendangs. This entry was posted on May 22, 2014 by Alan (travellingfoodies). It was filed under Food, Simple Eats and was tagged with chicken curry, crepe, fishnet pancakes, gulai ayam, johor, kari ayam, lacy pancakes, lermon grass, malay, Penang, Peranakan, Roti Jala, seray.